SEAMLESS NYLON SHELL FOR MAXIMUM DURABILITY. We want you to feel great while working on your next project. That is why we used the best material to produce Acktra Work Gloves. For this model, we use the synthetic shell, which is stronger than cotton. You will use them 2-3 times longer than your regular work gloves. POLYURETHANE COATING FOR BETTER GRIP AND EXTRA DURABILITY. Polyurethane is the strongest material used for work gloves. When you need your gloves to be sturdy but light and flexible, try our polyurethane coated gloves. It is truly a next level of work experience. THREE COLORS AND FOUR SIZES. Different sizes and colors are available to satisfy even highly demanding customers. We keep a broad spectrum of items to meet your size and color preferences. Choose between small, medium, or large sizes. Pick black, grey or white to your satisfaction. Why not look stylish when you work? WE PRICE OUR PRODUCT VERY CAREFULLY. We do not want you to spend a lot, we want you to be happy and remain our customer. That is why we offer the lowest price on the market. You pay just $0.98 per pair of gloves! If our gloves do not meet your expectations, we will give you a full refund, no questions asked. WE ARE HAPPY WHEN YOU ARE HAPPY. We do everything to provide you with the best customer experience. If you are satisfied or not happy with our product, please give us a review/feedback. It will help us further develop our business to fully satisfy our customers. SEAMLESS NYLON SHELL FOR MAXIMUM DURABILITY. We want you to feel great while working on your next project. 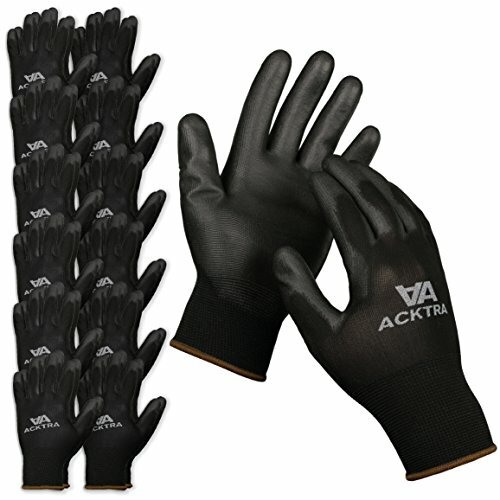 That is why we used the best material to produce Acktra Work Gloves. For this model, we use synthetic shell, which is stronger than cotton. You will use them 2-3 times longer than your regular work gloves. If you have any questions about this product by Acktra, contact us by completing and submitting the form below. If you are looking for a specif part number, please include it with your message.